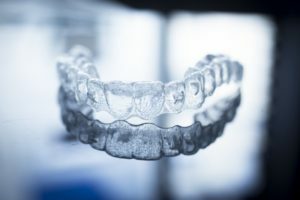 If you are one of the many people who is currently using Invisalign, then congrats! Before you know it, you will be seeing a perfectly straight set of teeth in the mirror. While the trays will certainly do most of the work, a little maintenance on your part will go a long way in helping your treatment progress as quickly and smoothly as possible. To help you keep your trays clean and your teeth healthy, here is an easy step-by-step guide. This might seem like a no-brainer, but many people end up just brushing their teeth with their trays on and calling it a day. Unfortunately, this leaves both the teeth and the inside of the trays unclean, which can lead to staining and even cavities if ignored for too long. Keeping your dental health in tip-top shape is essential for Invisalign staying on track, because nothing slows down the treatment like having to get a cavity fixed! If you do not clean your teeth consistently, the trays can actually trap food and bacteria against them, making decay more likely to develop. This will remove any food debris, but make sure you clean them with a soft-bristled brush and a gentle touch. Too much force and you might actually scratch your trays, which can affect their discreet appearance and create the perfect traps for bacteria. You should also only clean them with a clear, antibacterial soap as well. Regular toothpaste is too abrasive and can scratch them, and colored soap can cause stains. From time to time (about once a week), it is a good idea to soak your Invisalign trays in a denture solution to give them a deep clean. You do not have to do this every day, and your dentist in Williamsville can let you know which products are best to use. After the trays have been brushed and soaked, run them under some cool water before putting them back in your mouth. Avoid using hot water as this could actually warp the plastic and cause a tray to change shape. And that is it! These extra steps should only add a few minutes to your daily oral hygiene routine, and it will ensure that your trays and teeth look great throughout your treatment. When you are out and about and unable to brush, just make sure you give your trays a thorough rinse every time you take them out to eat. With that, it is just a matter of time before you have a beautifully straight smile to show the world! Dr. Barry Winnick is a Fellow of the Academy of General Dentistry and has been providing family, restorative, and cosmetic dentistry in Williamsville for decades. He is also an Invisalign Certified Dentist, so if you have any questions about what you have just read, he can be reached through his website.